Featured Image: File photo of Shankudeb Panda at a Trinamool rally. 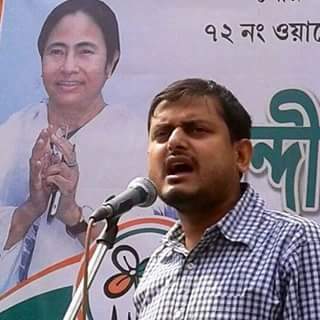 Kolkata, 14 December: WITHIN a few hours of being grilled by the Central Bureau of Investigation (CBI) for the second time in a month, Trinamool Congress Disciplinary Committee has removed Shankudeb Panda from the post of general secretary and all other posts in the party. Panda was summoned by the CBI to its CGO Complex office in Salt Lake on Monday morning. He had been asked by the CBI to come with all documents related to his involvement and financial dealings with the scam-hit Saradha Media Ltd. If sources in CBI are to be believed, Panda has named a host of Trinamool MPs, MLAs and senior leaders during his questioning by the CBI sleuths, which was followed by the submission of several documents by Panda. He has submitted his bank records, IT return papers and other financial documents related to the Saradha Group. The Disciplinary Committee of the ruling party hurriedly met on Monday evening and decided to remove Panda from all party posts. He has also been asked to move out of Trinamool Bhavan on E M Bypass, that has been his home for the past few years. Trinamool sources termed it an effort to clean up the party’s image and free Panda from the tag of being “influential” in the CBI’s record. Yet questions are being raised on the timing of the decision. Panda was questioned by the Enforcement Directorate officers on 29 December last year over his alleged role in the Saradha chit fund sacm. On 02 December, he was questioned for almost six hours by the CBI.